The organisers estimate that 'Rally for Life' attracted 90,000 supporters. Pro-lifers took to the streets of Dublin on Saturday to urge the country to vote ‘no’ in the upcoming referendum on abortion. The Irish constitution’s Eighth Amendment pledges to “defend and vindicate” the equal right to life of the unborn and the mother, “as far as practicable”. A referendum on whether to repeal the amendment is set to take place at the end of May. The organisers estimate that ‘Rally for Life’ attracted 90,000 supporters. 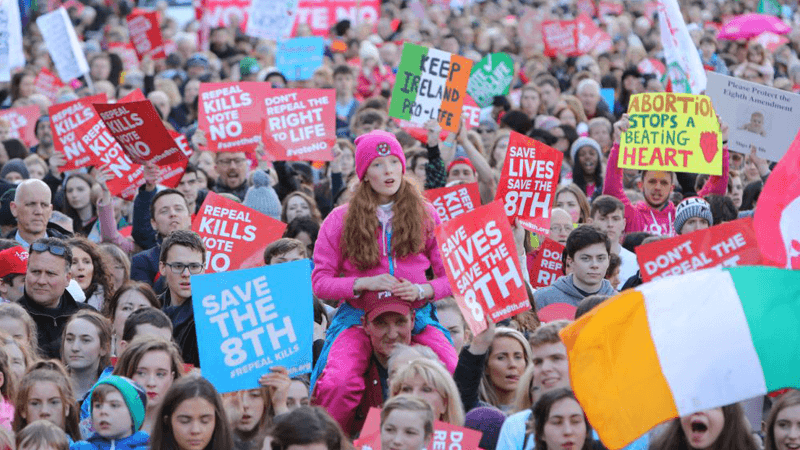 The Save The Eighth campaign, who led the rally, said it was “overwhelmed” by the attendance – one of the largest pro-life marches ever held in the country. “We know that in repealing the right to life there is no going back”. The Government has no right to impose this on us. Pro-life feminist Destiny Herndon-De La Rosa said: “Abortion is the ultimate exploitation of women, and is a symptom of women’s oppression. Ireland should lead the way by saving the 8th”. Charlie Fien, who has Down’s syndrome, also spoke to the crowd and warned against babies with the condition being targeted for abortion.